The Scovill & Adams Company made a wide spectrum of interesting cameras, almost all of which are relatively uncommon today. In addition to traditionally styled view cameras, the company offered apparatus built in the English compact style - view cameras that fold into a very compact "footprint." The Compact View is an American interpretation of the classic English compact veiw camera pattern. 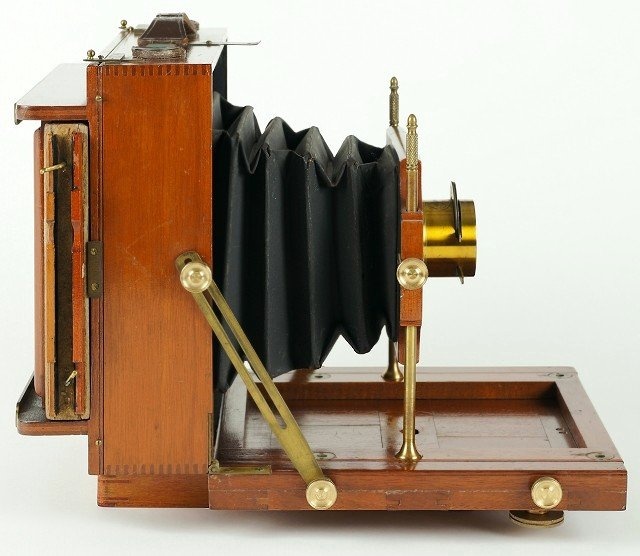 Believed to be in production from 1882 to 1898, it is constructed of polished mahogany featuring a cone bellows, brass trim, interchangeable lensboard, and patent reversible swing-back. The American Optical Company (an S&A subsidiary) also offered the same camera with a higher grade finish. In an age of boxy straight lined apparatus, the Compact View is a rare and unusual camera, distinguished by its sculptured front standard mounted on a pair of solid brass posts with beautifully milled "pineapple" decorations. The concave quarter-round shapes, notches and rounded edges on the front standard are purely ornamental and not found on any other camera in the Scovill & Adams inventory. The design was certainly a radical departure from traditional square shaped front standards, especially on the more conservative English compact designs. Looking at the front standard, I wonder what inspired this exotic look? From a manufacturing perspective, the front standard must have been expensive to fabricate and finish yet the result is esthetically pleasing. The 5x7 Scovill Compact view sold for $20 in 1892, which is about $379 in year 2000 dollars. Ironically, the camera's rarity is possibly due to the elaborate front standard. Using the camera is a complicated affair because the brass posts must be unscrewed from the bed when closing the camera, and screwed to the bed when opening the camera. No matter how a photographer used the camera, the brass posts were always being removed or changed. I believe these actions eventually led to a number of damaged cameras, especially the bellows and front standard mounts. In comparison to other cameras available at the time, the overall design appears to be very impractical considering the potential for damage; which may explain why there are only a few examples extant of this earlier style. Realizing the problem, Scovill & Adams may have changed the design to a traditional (square) front standard sometime after 1892, however the exact date is unknown. rare Goerz Choroskop II landscape lens and shutter. However the ground glass back provides additional clues to help pinpoint a specific manufacturing year. The rear assembly on this camera does not match the English compact style back shown in the 1892 catalogue entry, but is representative of a pattern found on the St. Louis Reversible Back Camera made from 1885-1889. Since the back has matching build/lot numbers (#23) with the rest of the body, it is considered original to the camera. Left: Profile view showing St. Louis pattern ground glass assembly. 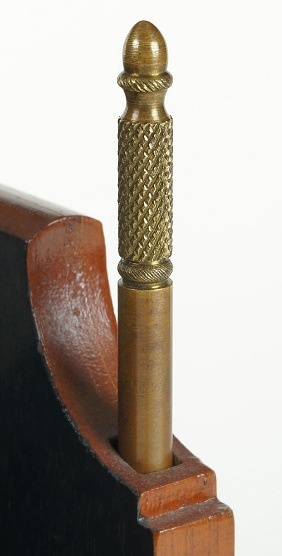 Right: Detail of brass post top. Reminiscent of a "pineapple" bed post, the milled section is a functional decoration that provides a convenient nonslip grip when tightening or loosening the support posts.